Children across the U.S. have now returned to school. Many of these children are going to schools with sworn police officers patrolling the hallways. These officers, usually called school resource officers, are placed in schools across the country to help maintain school safety. According to the most recent data reported by the Department of Education, police or security guards were present in 76.4 percent of U.S. public high schools in the 2009-2010 school year. In many of these schools, police officers are being asked to deal with a range of issues that are very different from traditional policing duties, such as being a mental health counselor for a traumatized child. This is an unfair request. For the past decade I have been studying how we police schools and punish students. My recent book, “The Real School Safety Problem,” and a growing body of other studies point to the fact that, indeed, schools ask police to do too much in schools. Not only is it unfair to the police, it can be harmful for children. Though there are no national data collected on exactly how many police officers are in schools, estimates suggest that the practice became popular in the early 1990s, as society began to rethink policing and punishment in the community outside of schools. That resulted in more rigorous policing practices and expansion of our prison system. In 1999, following the Columbine school shooting, when two teens went on a shooting spree, policing practices grew further: Federal funding was increased to have more police officers in schools. However, for over 20 years, school crime has been plummeting. Between 1993 and 2010 the number of students who reportedly became victims of a violent crime at school decreased by 82 percent. Since most schools are now safe places, officers in them aren’t needed to respond to many crimes. So they are being asked to do many other tasks. There are no national data on what officers do while at schools. But studies in specific schools find that officers are being asked to deal with mental health problems, family crises, self-injurious behavior and manifestation of childhood trauma. They also mentor students and teach law-related courses. Every jurisdiction makes its own decision about what officers should do in schools, and the training that they should receive to work in schools. The National Association of School Resource Officers does offer a week-long basic training course. That training does include a component on counseling and mentoring youth, but it is not clear how comprehensive the sessions are. Moreover, not all officers are required to take the course. But students’ mental health and other problems are, not surprisingly, often beyond the skills gained from a week-long course. Even if they are trained, police officers are not mental health professionals whose years of training and practice teach them how to calm youth down, assess mental health needs and address the underlying causes of student misbehavior. I have found in my prior research that the presence of officers can change the school environment in subtle ways – from one that focuses on children’s social, emotional and academic needs to one focusing on policing potential criminals. For example, in one school I observed what happened when a student overdosed on multiple bottles of cough syrup. Rather than the school seeing this as a mental health issue or suicide attempt, the school turned to its “go to” person for handling difficult student issues: the officer. After dealing with the initial emergency and ensuring the child went to the hospital, the officer’s (and thus the school’s) only response was to investigate what crime the child could be charged with, not what help he needed. Other research, too, shows that the presence of police in schools can result in increased arrests of students for minor behaviors. For example, a 2013 study by criminologists Chongmin Na and Denise C. Gottfredson found that schools that added police officers subsequently saw more weapons and drug crimes, and a larger number of minor offenses reported to the police. 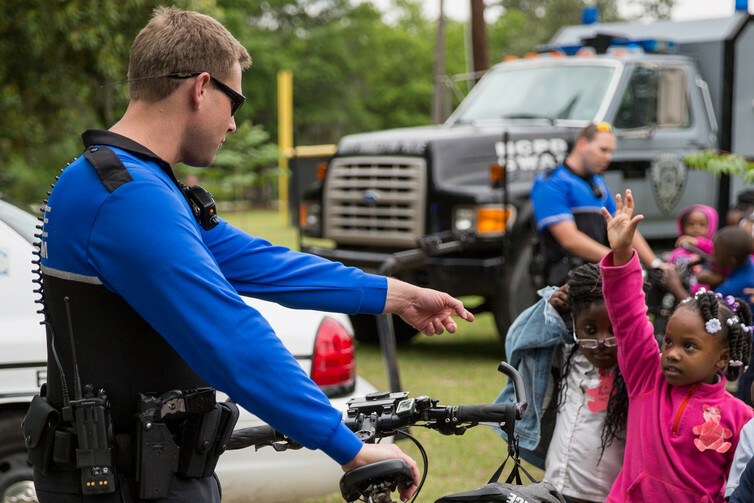 A 2016 study by University of Florida law professor Jason P. Nance found that the presence of a police officer predicted greater likelihood that student misbehaviors would result in an arrest. It is therefore not surprising that recent research from the University of Chicago Consortium found that the arrest rate in Chicago for African-American boys was twice as high as that for students in the school district, overall. Police officers in schools often serve as mentors and role models. For example, the officer I described above – who looked to charge a potentially suicidal student with a crime – had volunteered to work in a school because of his desire to help kids. He took time to advise youth and be a positive influence in the lives of many. Often students would come to his office to ask for advice, and just “check in.” He would respond with care and compassion. Though there is no sound evidence that police officers in schools prevent crime, it would be reasonable in my view to place officers in those few schools where there is violence. Despite steep declines in school violence, nationally, there are some schools where teachers and students face frequent threats of violence. Having said that, the cost of the daily presence of police outweighs the benefit in the majority of schools. For example, the officer I describe above as a caring counselor and role model switched roles dramatically when he thought a crime might have been committed. Then he would act like any traditional officer focused only on law and order. In those moments, he failed to address the underlying cause of the problem. By relying on him as the primary responder to student problems, the school replaced a focus on social issues and mental health with a focus on law enforcement. The result is that children do not receive the help they need, and officers are placed in a no-win position by being asked to respond to students’ needs as if they had the same training as a mental health professional. The fact is, policing alone cannot solve all societal problems. The author of this article is Aaron Kupchik, Professor of Sociology & Criminal Justice, University of Delaware. This article was originally published in The Conversation under a Creative Commons Attribution No Derivatives license. Read the original article here. Another excellent book is The Handbook for School Safety and Security that covers all the key areas needed for developing and implementing a school security program. If you are interested in these book, you can order if via the Elsevier Store for 30% off the list price and free global shipping. Apply discount code SEC315 at checkout.